Crude oil, once seen as a wealth-creating blessing for mankind, is fast turning into the devils tears. The struggle to control the worlds remaining energy reserves increasingly culminates in bloody conflicts and the killing of innocent civilians, with the war in Iraq only being the latest example. 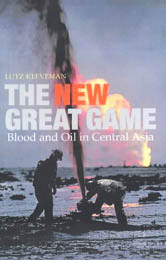 In The New Great Game, Lutz Kleveman gives us a fearless, insightful and exacting portrait of a new battleground in the violent politics and passion of oil: Central Asia, known as the "black hole of the earth" for much of the last century. The Caspian Sea contains the worlds largest amount of untapped oil and gas resources. It is estimated that there might be as much as one hundred billion barrels of crude oil in the former Soviet republics of Kazakhstan and Azerbaijan alone. Using the concept of the 'Great Game' that Rudyard Kipling immortalized in his novel Kim, Kleveman argues that now a new 'Great Game' rages in the region, a modern variant of the nineteenth century clash of imperial ambitions of Great Britain and Tsarist Russia. Only this time the stakes are raised. Desperate to wean its dependence on the powerful OPEC cartel, the United States is pitted in this struggle against Russia, China, and Iran, all competing to dominate the Caspian region, its resources and pipeline routes. Complicating the playing field are transnational energy corporations with their own agendas and the brash new, Wild West-style entrepreneurs who have taken control after the collapse of the Soviet Union. Traveling thousands of miles, from the Caucasus peaks across the Central Asian plains down to the Afghan Hindu Kush, Kleveman met with the principal Great Game actors between Kabul and Moscow: oil barons, generals, diplomats, and warlords. 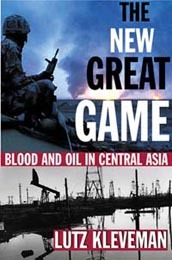 Based on extensive research, The New Great Game is a gripping narrative, and a savvy and incisive analysis of the power struggle for the world's remaining energy resources.